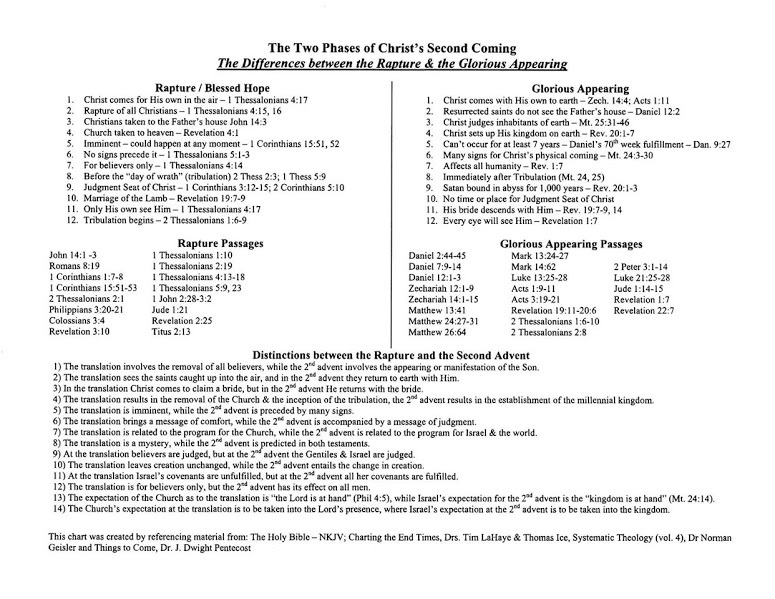 There has been so much confusion over the two future comings of Christ, that I have decided to make a comparitive list of them side by side. It is my hopes that this will sweep aside all doubts to the Biblical distinctions between the two. 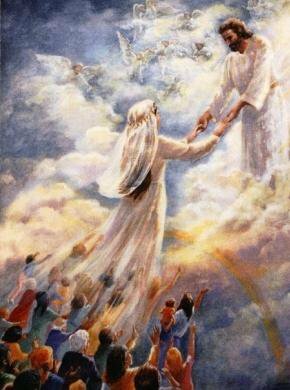 To get His bride "the Church" to marry her in heaven before His 2nd coming to earth. And for the Church to escape the Tribulations to come. To save the nation of Israel, destroy His enemies (esp the AntiChrist, Beast, and False Prophet), and set up his 1000yr kingdom at Jerusalem. How far down will Jesus come. Come down to the clouds in the atmosphere. All the way down to the ground, the Mt. of Olives across from the Temple Mount in Jerusalem. When will His coming be. No one knows day or hour. We are told no information of what must happen before rapture can take place. The 1st seal is the AntiChrist and we know the AntiChrist sets up a 7 yr covenant with Israel, breaks it 1/2 thru and will sit in Temple as God. The AntiChrist confirming a covenant with Israel, the False Prophet doing miracles, The 7 seals, 7 trumpets, and 7 bowls all precede the 2nd coming. Also before, will be 2 witnesses who have power to call down fire from heaven, turn water to blood, and prevent rain. Their deaths and bodies on display will be seen around the world and their rapture will be followed by a city splitting earthquake. Where will the Church be. The Church is caught up into the air and taken to His Father's house (Heaven) to be with Jesus. From then on the Church is in Heaven where she is married to Jesus, just before the 2nd coming. The Church comes down with Jesus. Who will see Him come. Just the Church as no one else is looking for Him. Everyone on the whole earth. The Bible says clearly that we, as believers in Christ, will be grabbed from the earth to meet Jesus in the air and then head off to where Jesus is which is Heaven. We will not be doing yo-yo of going into the air and then coming back down to earth. Here is the verses that prove this. You'll notice there is no mention of the 1000yr reign of Christ here nor any mention of us coming back down to earth. We will be with the Lord and the Lord is where? In Heaven. Also Jesus himself indicates He is building homes for us in Heaven and that He, like a bridegroom will come and take us to live with Him. The mansions are in His Father's house which is IN HEAVEN. Lastly if you think this is escapism, it is. After all Jesus called it ESCAPE from the tribulations he described. As you can see Jesus coming for the Church is complete different in all respects to Jesus coming in the so called 2nd coming as described in Revelation. People recently are insisting that to be ready for the rapture one has to be busy for the Lord. This is unBiblical and mirrors many cults like the Jehovah's Witnesses who go as far to say when Jesus returns, any who are caught not prostilizing at that moment will be left behind and can end up in losing your salvation, ending up in Hell. 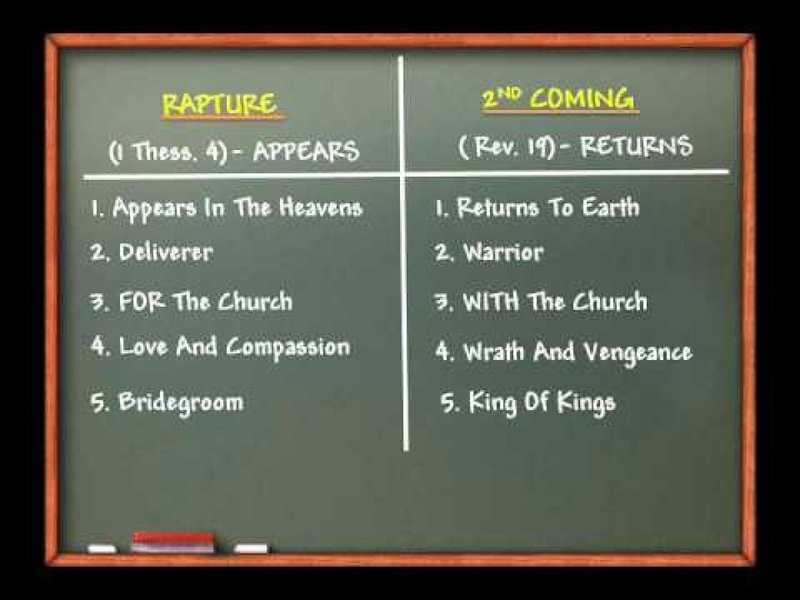 Rather the Bible states clearly that all believers in Jesus will be caught up in the Rapture. Beware those who try to make it works dependent because salvation is a free gift from God. You can't do anything to make yourself more saved and you can't do anything to make yourself unsaved. God says He does not change His mind from moment to moment like humans do. The only way to be TRULY ready for Jesus return for His return for His bride, the Church, is to believe in Jesus for your salvation. For Jesus is coming back to catch up those who are his. Yes is really just that simple. Pray this prayer and accept the Lord Jesus by believing in him today.